Want to get your hands on the Rift's new "Half-Moon" controller? You won't have to wait very long. The Oculus Touch will be available in the first half of 2016 - i.e. sometime between January and June of next year. The Facebook-owned company unveiled the first prototype of its new pads at a pre-E3 event held on June 11. So how will it work? 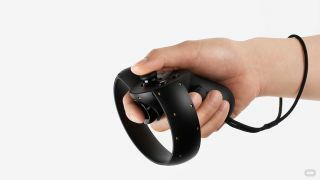 Like the Rift itself, the controller will have small white tracking dots located along its ring-shaped exterior that will allow the Oculus' camera to pick up where they are in the room. Add to that a control stick, a trigger located on the back and two buttons on the front face and you have an input as innovative as the Rift itself. While there's not an exact release date at this point, the fact that Oculus has a working prototype and is willing to show it on-stage bodes well for a similar launch window to its VR set.